The image of Maj. Gen. Qassem Suleimani purportedly showing him on an Iraqi battlefield was published on the website of IRINN state television. Iranian television published a rare picture Monday of its elite Quds Force chief in Iraq that was widely circulated online, puncturing the mystique of one of the region’s most powerful men. The image of Maj. Gen. Qassem Suleimani purportedly showing him on an Iraqi battlefield was published on the website of IRINN state television and repeatedly shared on Twitter. 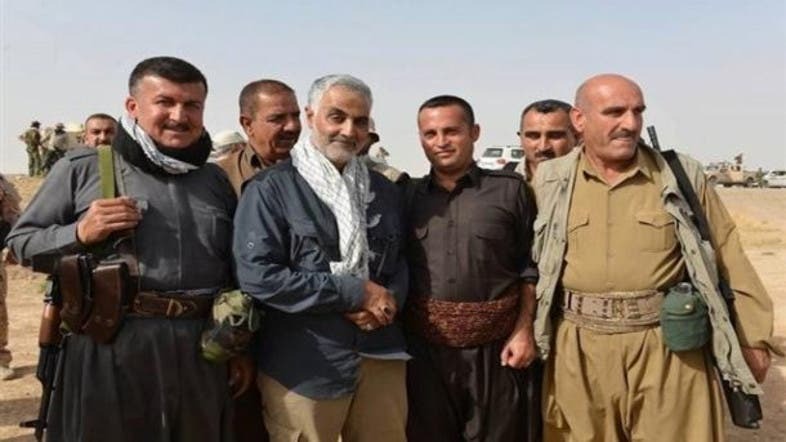 Grinning widely, Suleimani, easily identified by his greying hair and beard, was seen standing alongside Kurdish Peshmerga fighters. IRINN did not say where the picture was taken. Iran initially denied Suleimani was in Iraq but several pictures used in official media have appeared to confirm his presence near battles against militants from the Islamic State of Iraq and Syria (ISIS). The Quds Force, a branch of Iran’s Revolutionary Guard, is highly secretive and conducts security functions abroad deemed necessary to protect the Islamic Republic. As its leader, Suleimani is seldom mentioned in Iranian media but he has cultivated a reputation as one of the most influential security operatives in the Middle East. Since the Iraqi government was caught out by the ISIS surge this summer, Iran has played a key role in trying to roll back the offensive by the extremist militant group, sending military advisers and arms across the border. Suleimani was previously pictured near the Iraqi town of Amerli, which Kurdish fighters, Shiite militias and the Iraqi Army liberated on Sept. 1. Again, the images were circulated on social media. A senior Iranian justice official also recently stated that Suleimani was present during fighting near Erbil alongside Kurdish forces in early August, going against his reputation for remaining out of sight. The Iraqi military’s collapse at the hands of Sunni Muslim militants near Iran’s border invokes fear in Tehran. Bonded by Shiite Islam, Iran and Iraq have grown closer in the realms of government and security since the overthrow of Sunni leader Saddam Hussein in the U.S.-led invasion of 2003. Iranian media regularly report the death of Iranian “volunteers” killed in Syria and Iraq in fighting against militants. The authorities claim the combatants are there of their own choosing to protect Shiite holy sites.